If you want to understand the toll the last 16 years of short-sighted City Hall governance has taken on the City's soul, the quickest way is to take a dispiriting stroll down upper Broadway, anywhere between Columbus Circle and 96th Street. The central vein of the Upper West Side—a neighborhood that was long a bastion of New York's penchant for independent thinking and expression—has been almost completely denuded of local, individualized businesses. On some blocks, it's impossible to find a single storefront that isn't an outpost of some corporate entity. It could be Dayton or Scottsdale, for all the personality. As with SoHo, without the unique architecture, the area would be completely undistinguished. 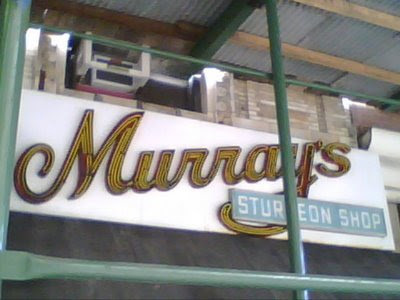 MURRAY'S STURGEON SHOP: We'll start way the hell up north, on Broadway near 90th Street, with one of the region's mercantile gems. This narrow store has been here serving up fish and meats and soup since 1946 under several different owners. The current owner, Ira Goller, has been there since 1990. BARNEY GREENGRASS: "The Sturgeon King." To a certain extent, culinary life on the UWS has always centered on the finding and consuming of very good smoked fish. At Amsterdam and 86th Street, you get some of the best. Barney Greengrass (what a name!) has been luring them inside in droves for a century with its classic version of the Jewish "Appetizing" store. There's an accompanying restaurant, whose few tables are crammed together and routinely occupied. WEST PARK PRESBYTERIAN CHURCH: Next door to Barney is this slice of red sandstone. The UWS has a lot of great churches. I'm including this one, however, because through some mystery it has never been landmarked. The 1890 building is a rare example of Richardsonian Revival, a robust style I dearly love. The church is currently closed and things don't look good for it. AMERICAN MUSEUM OF NATURAL HISTORY: Go over to Columbus and walk off all the food from Murray's and Barney's on the way down to 81st Street, where the huge Museum of Natural History takes up a few blocks. Take it in. It's kinda impressive. If you decide to go in, don't forget to go to the Hall of Ocean Life and stand under the model of the Blue Whale. Nothing quite places you in New York as does standing under that whale. DUBLIN HOUSE: Turn west on 79th Street and head to Broadway. You can't miss the Dublin House. It's got a big neon harp outside. A great old watering hole as old an any business in the area. ZABAR'S: OK, now you're within the UWS's heart of hearts—the tight ten blocks or so where the neighborhood still looks and acts the most like itself. Landmarks, both of the architectural and cultural kind, are thick on the ground from 81st to 71st, starting with the business that perhaps epitomizes La Vie Upper West Side more than any other: Zabar's. Crowded, cluttered, full of itself, beloved, hated, overproud and justifiable so. However you slice it, it's an experience. 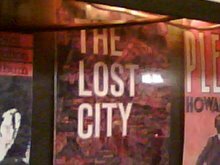 WESTSIDER RARE & USED BOOKS: A narrow, hard-to-navigate, used book store across Broadway from Zabar's. A quintessentially New Yorky space and business. It's easy to lose a couple hours in here. 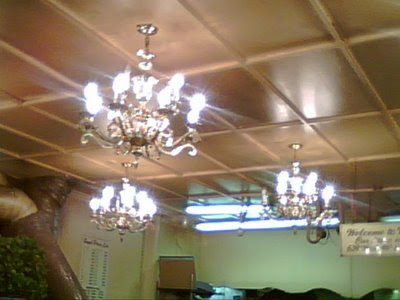 H&H BAGELS: Head south a block and enter the boiled-dough shrine that is H&H Bagels, as praiseworthy for its fat, circular bread products as for its spare, unshowy (save the weird chandeliers, above) decor. THE APTHORP: At 79th is the Anthorp, one of those places where every New Yorker, at one time in their lives, dreams of living. Built on land acquired by William Waldorf Astor in 1879, and filling a full city block, it has an enormous, dreamy inner courtyard that evokes Europe, and the feel of a Renaissance palace. It should. It was modeled on the Pitti Palace. FAIRWAY: Further down Broadway, around 75th. The food miracles keep coming. This is the original, the hopelessly crowded, the infuriating, the spendiferous Fairway. "Unlike Any Other Market." And they're right. It is. It's like a Middle-Eastern bazaar, in its multitude of products and its boisterous, rude, heterogeneous clientele—only with a roof. CITARELLA: Never my fishy cup of tea (a little too hoity-toity, and too pricey), but generations of New Yorkers have sworn by it. It's 97 years old, for Christ's sake. I give it its due. THE BEACON THEATRE: At 74th Street on the east side of Broadway, a 1929 Art Deco gem, recently restored. FISCHER BROTHERS AND LESLIE: Turn right at 72nd. Half a block in, on the south side, is the family-owned butcher Fischer Brothers and Leslie. Hideously expensive, but they know what they're doing, meat-wise, and they keep the Glatt Kosher flame burning on the UWS. 72nd STREET SUBWAY KIOSK: As you turn around and re-cross Broadway, look at and admire the landmarked subway kiosk at the 72nd Street stop. If every subway station had a kiosk like this, what a place New York would be! It's 105 years old. One of only a few remaining in the City. THE DORILTON: Glance down Broadway to 71st Street. That big red-and-white buster on the left is the Dorilton, built in 1902. TIP TOP SHOES: Keep going east and head to this largish, 69-year-old rarity: an enduring family-owned shoe store! Lots of New York personality. (Maybe too much; charm, the sales clerks sometimes lack.) And the name and sign are to swoon from. THE DAKOTA: Keep going east until you hit the park. Here is the Dakota. If you've never heard of it, there's something wrong with you. Built in 1880, it was so named because its then-surroundings were as empty and desolate as the Badlands. It has another of those great inner courtyards you only find in large apartment buildings on the UWS. All famous Upper West Siders who haven't lived at the Apthorp has lived at the Dakota. EMERALD INN: Double back to Columbus and walk down to 70th. Nothing so special, except that it's been around for 70 years or so. Recently, it was threatened with extinction. Drink up; you're almost done walking. TAVERN ON THE GREEN: In Central Park, near 67th, it the sprawling, be-mirrored, over-chandeliered, ever-cheesy Tavern on the Green. But it's one of a kind. And when you're eating your Eggs Benedict in the Crystal Room on a Sunday morning and the equestrians gallop up outside the glass wall to rest their horses, it can be kind of magical. CAFE DES ARTISTES: On 67th near the park, it is 92 years old and a byword for romantic dining. Known for its murals. The kind of New York landmark that wouldn't change if you held a nice to its throat. Yea my neighborhood! Thanks for this it's great. I live on 72nd and have to make two comments... Citarella is worth every penny because you will never get better qulity fist and the people who work there are polite and know there stuff (unlike filthy crowded Fairway) and I would give anything to be able to go inside the Apthorp. The architecture on the outside, archway and courtyard is amazing and I can't even imagine how it looks inside. The Apthorp is truly a "they don't build 'em like that anymore" place. Thanks for posting this! Yay for the Upper West Side. Great tour. The two things I'm sad about is the West Park Pres Church - it's *such* a shame it's not landmarked. And it would be awful if they razed it...because you know for sure, what'll go up next is a giant condo tower with a Whole Foods below. Though, I won't lie. I wouldn't turn down a Trader Joe's. And the other one, not mentioned, probably because it's a little higher up - the Metro (Midtown?) theatre, the gorgeous terracotta art deco theatre up at like a 100th/BW? The one that's destined to be an Urban Outfitters? While I'm very sad it's going to be a UO, I'm happy it's going to be put to use again. Supposedly Trader Joe's is coming to 72nd and B'way where that new construction is. Oooh, cool. Thanks, Little Fish! Don't forget Fine and Shapiro's on 72nd. Levain Bakery is amazing. 74th and Amsterdam. What's the story on Trader Joe's at West 72nd Street? It would be such a welcome relief from the present more expensive and lesser quality offerings at Fairway, Zabar's and Food Emporium. I love Whole Foods, but they are way too pricey. Anyone know when TJ's will come to 72nd Street? One of the best indy stores on Broadway in this stretch - The Town Shop. It's pink bag is a guarantee of well-fitted lingerie!. Nice tour, I like the mix of upper west side establishments you chose, but don't leave out Deli Kasbah, the best kosher deli in the neighborhood! 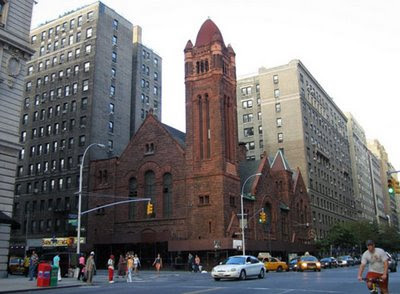 Fortunately, West Park Presbyterian received landmark status last month. So we can all exhale. Shlomo, soapbox speaker on 92nd st.
Well, Trader Joe has arrived...to the dismay of some, including Grand Dame Gael Greene. As a dedicated food shopper, I left my debut visit to the Trader saying, I'd never go there again. That was about 3 dozen visits ago. There's something about the place, almost hard to quantify. But the mood is good, and the offerings offer treasures to those who select carefully. 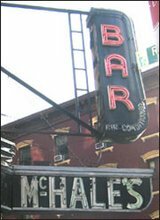 Two examples - their rack of baby lamb - as goos as you'll find anywhere...and their coffee, though it comes in a vaccum packed can is also as good as you will find anywhere - including McNulty's and my perennial favorite, Puerto Rico Importing Company. Try the House Blend. A real culture shock is to shop a little at Trader Joe's and then hit Fairway. So - just because it's new to us good ol' UWSiders, doesn't mean it doesn't deserve its place. I can't believe people are dissing Fairway for Trader Joe's. Are you kidding me? Fairway is crowded because it's great - it's got the gourmet stuff you'll find for 15% more at Citarella and the cheapo bulk stuff you'll get at TJ's and everything else under the sun! I used to live on 77th/Bway, and though I've moved to Astoria I still go to the UWS Fairway at least once a week to stock up. Can't beat the prices for the quality and selection. West Park Pres Church is being restored, I attend services there at sanctuary new york city which is a new thought church and is now leasing the church in partnership with west park. they just put in a new boiler. You should correct you comments on H & H Bagel. You'll have to wait a while. Supposedly they are going to reopen, somewhere, but not at that location. And the one down at 46th & 11th is gone. Fairway's bagels aren't too bad and you don't have to take out a bank loan to buy one!